Here's my take on the traditional Hanukkah food - the potato latke. These were a big hit in my house tonight. I don't often make them because I absolutely hate grating potatoes, but tonight's batch was definitely worth the elbow grease. Mix ingredients well and fry in hot oil. I prepared the mix and Brad fried them. The kicker here - and the reason that this recipe is a winner is the lingonberries, a type of Swedish berry or preserve. They are a bit hard to find (you can buy them online, at Wegmans or Whole Foods, or apparently also at Ikea according to the receptionist at Aquavit who I spoke with this morning). I went to Whole Foods, although I love the idea of newly minted college graduates picking up some lingonberries with their ready to assemble desks, with only Swedish assembly instructions. Lingonberries are, in fact, a Scandinavian delicacy and the combination tartness/sweetness of the lingonberries is perfect with the sweet potato and chipotle. It is a stellar combination of flavors. Do not substitute any other preserve, as if will not be the same. No joke! These are the best latkes ever. The lingonberry makes for the perfect complement to the sweet potato and chipotle latke. They serve meatballs with lingonberries in the cafeteria at IKEA. The store itself is kind of a hellish experience, IMHO, but the food is not half bad if you are stuck there all day. They have gravlax too, and various other scandinavian delicacies. 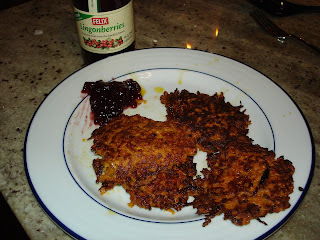 It may not be the same, but I'd be willing to substitute some of the port wine-infused cranberry sauce we had during Thanksgiving as an accompaniment to these latkes. The tangy, rich sauce went beautifully alongside our mashed sweet potatoes on that day, and I'd bet the payoff with these would also be quite good.